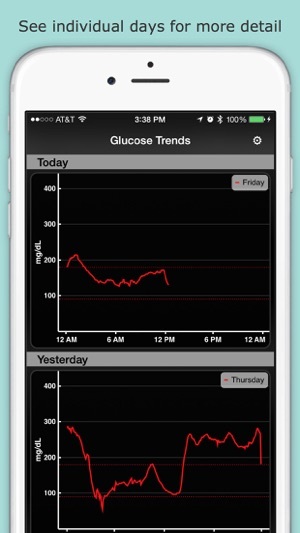 Glucose Trends analyzes your Blood Glucose data from HealthKit in a graphical format. It all happens directly on your iPhone. If you use a CGMS that writes your blood glucose values to HealthKit, this App is a must-have. I'm a type I diabetic and I made Glucose Trends for myself. I hope you find it as helpful as I do. 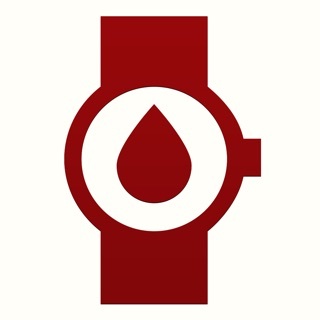 I use the Dexcom G5 Mobile App to continuously monitor my blood sugar levels. (Glucose Trends will work with any app that sends data to health kit) I love my Dexcom. It's changed my life. I also love the data it gives me, but I grew tired of the process I had to go through to download my data and analyze it. 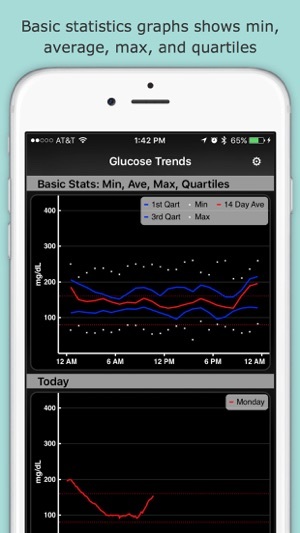 Glucose Trends will take your blood glucose data that is stored in Apple's Health App and provide you with several useful graphs. First, the last 7 days are each graphed so you can see how you are doing managing your blood glucose levels. Second, an hourly average comparison will show you how the current 7 days compares to the previous 7 days, hour by hour. Third, a basic statistics graph showing mid, mid, max, and quartiles. And finally, the last 2 days are graphed individually so you can clearly see those days in detail. You can adjust your high and low warning lines, as well as the number of days to include in your hourly comparison graph. 1. 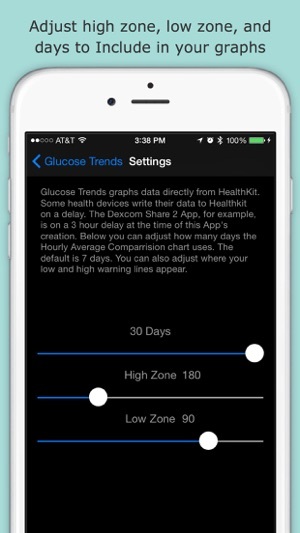 You must have your glucose data in HealthKit. This app only graphs data that is written to HealthKit. I personally use the Dexcom G5 Mobile App. Be sure you've told that App to share it's data with HealthKit. 2. 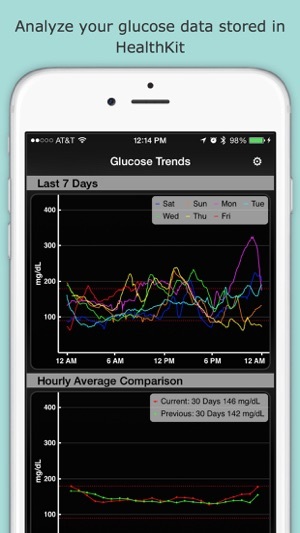 You must grant this app permission to read Glucose Data from HealthKit. Fixed a bug that was causing the hourly average comparison chart to not show any data for people that have a large quantity of glucose data stored in health kit. Update to my prior review below: this app works in conjunction with Health on your phone to capture data. It will crash for the first 24-48 hours of use because it needs the data to function. Be patient! 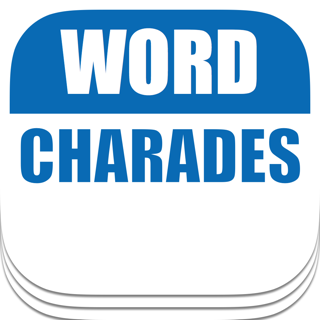 I am an actual user of this app and have found it the BEST diabetic insulin pumper's friend. Entirely worth the time and effort me its benefits are great to see the necessary trends to make good insulin delivery decisions. I have been using this app now for nearly 6 months. 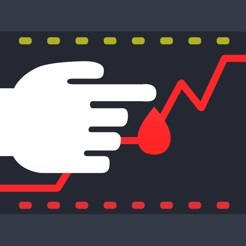 Although it will take a couple of days to start showing data, once it does it is extraordinarily useful in seeing trends and making good decisions on insulin use and glucose control. I prefer it to Dexcom's Clarity as I have the info on my phone and can review instantly. I also have the additional benefit to see short trends and long trends by varying the scope of the statistical period. Works very well in hand with Health in keeping a record of my Dexcom's readings. Only real shortcoming is you can lose all data and graphs if you switch to a new phone or have to reset your device. It would be nice to have a print and/or save function. I have only used this with Dexcom. I do not know or believe it works with Medtronic's sensor even with the addition of their new link device. All I can say is I can't believe how many trends I've already been able to spot opening this app once a day. Thank you so much for making this. Requires iOS 8.0 or later. Compatible with iPhone and iPod touch.